Namgyalma. Over 2000 Advanced Energy Workshops for Physical and Spiritual Evolution. "Awaken To Namgyalma's Divine Vibration"
By sincere activation of Namgyalma's Empowerments 5 Initiations and mandalas you will receive blessings for a long & meaningful life and bring yourself purification and protection. The Namgyalma workshop is wonderful medicine that can universally free you from sufferings in the cycles of birth and death. Namgyalma will help you overcome your sufferings and help you obtain happiness, increase in prosperity & longevity. Namgyalma will help you achieve rebirth in a world of light populated by Immortal Enlightened Beings. Namgyalma represents the Mother of all Buddhas. Namgyalma real name is, Tsug Tor Nam Par Gyelma (Tibetan), shortened to Namgyalma or Usnisa Vijaya in Sanskrit. The eight-armed goddess Namgyalma is one of three deities associated with longevity and the fulfillment of earthly desires. The other two are White Tara and Amitayus. Like all deities, she is essentially a manifestation of Emptiness acting as a bodhisattva. She is able to bestow longevity on beings not for selfish reasons, but for the purpose of helping others towards enlightenment. She is a purification deity and these Empowerments will help you invoke Her powers as a means of settling disputes. Namgyalma practice is very powerful not only for granting long life but also for purification. There is also a Amitabha Empowerment and technique for spiritual expansion in this Workshop! It will also produce a profound sense of tranquility, inner calm and peace. Bad karma incurred from previous lives will be destroyed altogether. Namgyalma has the power to liberate parts of the soul trapped in the clutches of lower entities. 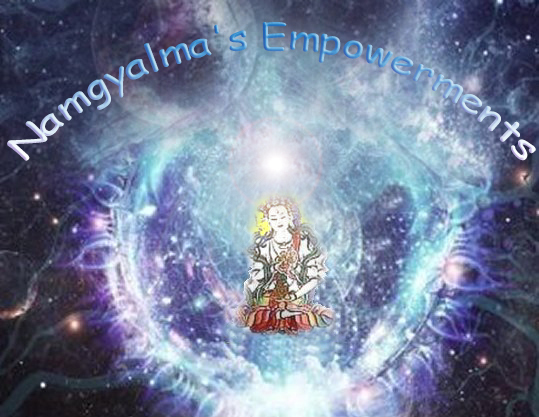 You will receive the Namgyalma Manual via Email, All Empowerments and emailed certificate. Plus full email support is given before, during and after all my Workshops.